To create this simple nailart, I used two nail polishes from Soo Nails in #s29 (Red) and Chrome Gold that didn't have a sticker with the number/name. This look can be achieved two ways: the longer and simpler way or the quicker and harder way. I did it the harder way because my hands are steady and I always prefer to do my nails quick. 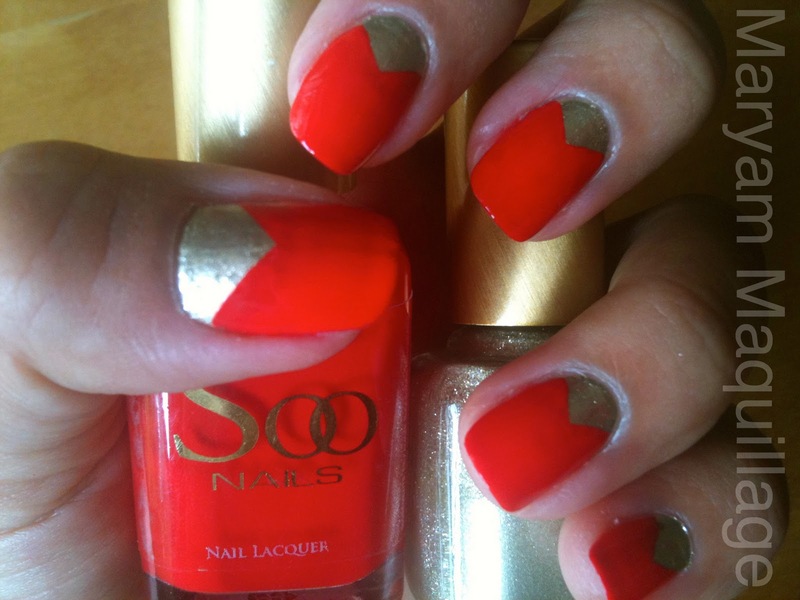 Use a red polish to paint an upside down v-shape over the gold by swiping once diagonally from the bottom corner of the nail to the opposite top corner and repeat on the other side. Fill in the empty portion with the red polish and you're done. Finish with a top coat of your choice. Paint your entire nail with the red polish and wait for it to dry completely (drying time will vary depending on the quality of the polishes) TIP: To test if the nail polish is dry, tap the bed of your painted nail with the bed of another painted nail. If there's no stickiness, the nails are completely dry. Using any tape as a stencil, take one small piece and tape it down on your dry painted nail from the bottom corner of your nail diagonally to the top corner and repeat on the other side. 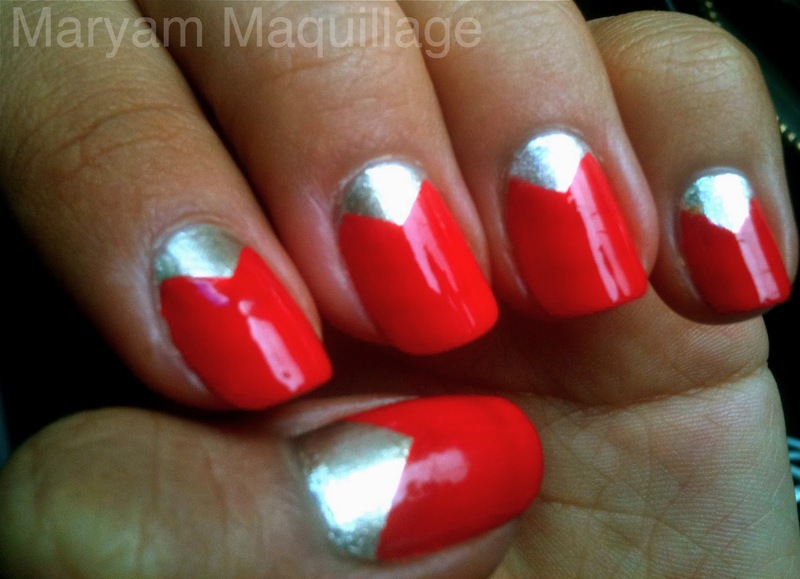 Make sure to leave the bottom portion blank--you should end up with a triangular shape on the bottom of your nail. 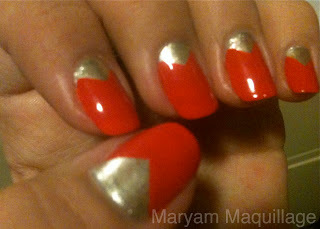 Using a gold nail polish, paint over the red polish the area marked off with tape. 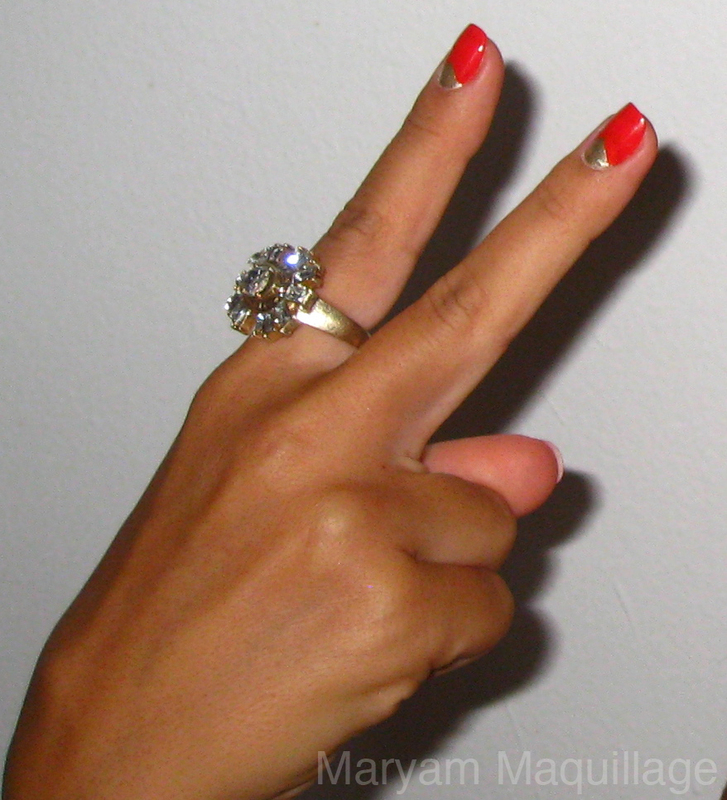 Your polish should be opaque, otherwise it will require a couple of coats to cover the red. Wait for the gold polish to dry completely and peel off the tape. Finish with a top coat of your choice. I love this. I have wanted to do something like this for awhile now. Thanks for the instructions on how to do it. I LOVE IT!!! must try. Your ring is beautiful too! These are such fun nails! fierce doesnt even begin to describe! love these red-hot nails! I love it!! & your ring too of course! Love it! I'm not sure if this is what you were going for, but it kind of reminds me of an 80's meets futuristic type of thing. I may try some variation of this!